Click above to see larger. Note: the Metro Board decided in May to build the Leimert Park and Hindry stations. Metro today provided the agency’s staff recommendation for a contractor to build the 8.5-mile Crenshaw/LAX Line. Staff is recommending a contract in the amount of $1,272,632,356 to Walsh/Shea Corridor Constructors. The contract includes stations at Leimert Park and Hindry that were approved last month by the Metro Board of Directors. Walsh/Shea is a joint venture between Walsh Construction and J.F. Shea Company. Walsh/Shea has collaborated to work on many other rail projects in the United States, including the DART system in Dallas. Walsh/Shea was one of four firms to submit proposals for the contract. The Metro staff evaluation gave Walsh/Shea the highest technical score; Walsh/Shea also had the lowest bid in terms of cost. The Metro Board of Directors will decide on the contract award; the Board can choose to accept or reject the staff recommendation. The Board’s Construction Committee will discuss the contract at its meeting on June 20 and the full Board is scheduled to vote on the contract at their monthly meeting on Thursday, June 27, at Metro’s headquarters adjacent to Union Station. The meeting is scheduled to begin at 9 a.m. Both the committee meeting and full Board meetings are, as usual, open to the public. The Crenshaw/LAX Line is one of 12 transit projects being funded by Measure R, the half-cent sales tax increase approved by Los Angeles County voters in 2008. 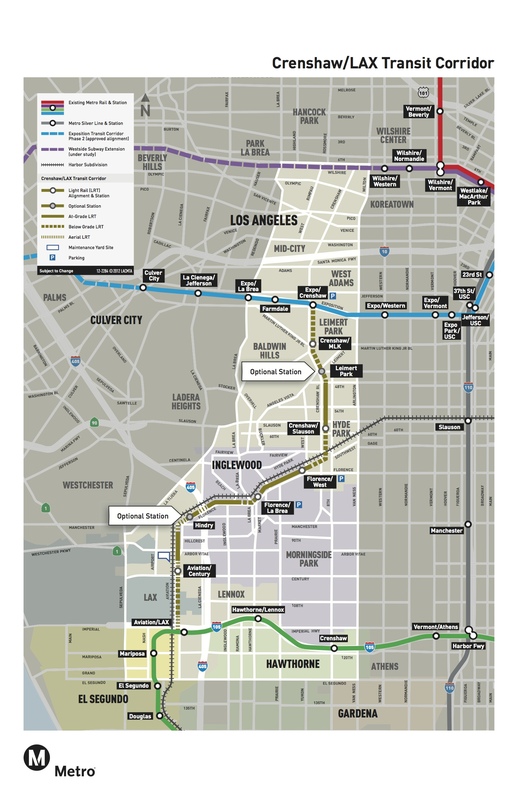 The light rail project between the Expo Line and the Green Line is currently forecast to open in 2019 with major construction beginning in 2014. Utility work is already underway. The Board is also being asked to add funds to the project’s budget to include the Leimert Park and Hindry stations, as well as extra contingency funds, bringing the project’s budget to $2.058 billion, assuming all the funding sources come through. The budget also includes funds for new rail cars, a rail maintenance yard, real estate acquisition and the costs of planning the line and other items not included in the contract total. •The line is forecast by Metro to have average weekday boardings of just under 25,000 by the year 2035. Metro and Los Angeles World Airports are working together on another Measure R project that would connect the Crenshaw/LAX Line to LAX via either light rail, bus rapid transit and/or people mover. That project is currently scheduled to be completed in the late 2020s and will depend on funding from the city of Los Angeles. •For those who want the Park Mesa Heights segment placed underground instead of running at street level, I want you to understand the process. First and foremost, it needs to be understood that the Board of Directors and the Federal Transit Administration have approved the project with a street-running segment through Park Mesa Heights. The Board has stuck with this decision. Firms that submitted proposals for the project were allowed to submit “Alternative Technical Concepts” (or ATCs) that could potentially lower the cost of the project, improve its quality, reliability, performance or schedule. However, Metro did not consider ATCs that significantly changed the project or required a supplemental environmental impact statement/report. Three points worth considering about the stretch of tracks through Park Mesa Heights. 1) The street is 180 feet wide and a train can safely operate in the median, as streetcars used to on Crenshaw; 2) Building a tunnel for this segment would cost up to an additional $250 million; 3) Adding a tunnel at this time would require that the final environmental studies be re-done, which Metro officials say would take nine to 18 months and could jeopardize federal funds being used to help build the line. When the train line is completed, Crenshaw Boulevard will have three general traffic lanes in each direction through Park Mesa Heights, in addition to a parking lane and bike lanes. Metro says it will plant two trees for every tree removed to build the project. •The train will pass near Crenshaw High School. Metro light rail trains currently pass near Dorsey High School (Expo Line), Blair High School (Gold Line), Mendez Learning School (Gold Line) and Ramona High School (Gold Line) and have thus far done so without incident. Metro has worked closely with the California Public Utilities Commission and the city of Los Angeles to incorporate safety features into the Crenshaw/LAX Line, including fencing, signage, pedestrian gates, crosswalks and security cameras. •For those who are comparing the Crenshaw/LAX Line to the Blue Line: The Blue Line opened in 1990 and was the first modern light rail project in our region since the streetcars stopped running in the early 1960s. Many safety features have been added to the line since then and overall incidents have declined. Metro is continuing to add more safety elements along the line, including a new effort to reduce suicides. •About 55 percent of the Crenshaw/LAX Line is separated by the street — that is, 55 percent of the line will be in a tunnel, in a trench or an aerial structure above streets. By comparison, the Blue Line is 20 percent grade separated, the Pasadena Gold Line is 42 percent, the Eastside Gold Line is 37 percent and the Expo Line is 20 percent. The Green Line is 100 percent grade-separated because it runs in the median of the 105 freeway and aerial structures. This is also the reason that on a per mile basis, the Crenshaw/LAX Line will be the most expensive light rail line that Metro has built. The Purple Line Extension subway will be more expensive but it is a type of transit called “heavy rail” that can carry more people and run at higher speeds. It is being built as a subway because of the dense area along its alignment (mostly under Wilshire Boulevard) and expected high ridership. •The Crenshaw/LAX Line is a design-build project, meaning a single contractor is responsible for the final design and construction of the contract. The idea is that some design and construction work will overlap, which will help the project be built more quickly. •Among some of the big tasks: building the underground station boxes at the two northernmost stations at Exposition & Crenshaw and Crenshaw & Martin Luther King, Jr., boulevards. It is expected that the contractor will lower the tunnel boring machine (TBM) into the ground at Expo & Crenshaw and then tunnel south, either extracting the TBM at Crenshaw/MLK or proceeding south to the Leimert Park station at Vernon & Crenshaw. •With major federal funding in this project, Metro is prohibited by law from “local hiring” of any specific ethnic group. However, the Metro Board approved a plan (called a Project Labor Agreement, or PLA) to implement targeted hiring focused on unemployed and disadvantaged workers while also providing apprenticeship opportunities. Under the Project Labor Agreement, Metro has identified areas by zip code where there is a high number of these workers and that includes South Los Angeles and Inglewood. •Metro is requiring the contractor to make up for the loss of parking during construction. Also, Metro is preparing profiles for every business along the alignment to identify their type of business, hours of operation, number of employees, access for customers and how deliveries are made. Once a contractor is hired, the contractor will begin working closely with local businesses, the Crenshaw Leadership Council and others. Very interesting stats. I really think the park mesa segment should be at grade. Streets are wide enough. And the cost isn’t justified. I just can’t believe Metro is projecting 25k riders by 2035. Considering the expo Line has already reached that benchmark, it’s hard to justify spending more money to tunnel in that segment. I am glad they got the two additional stations. This is a joke right? You mention a report, but neglect to provide it? You mention Alternative Technical Concepts (that thoroughly rebut many of the assertions made by the way), but also fail to make those public. Is this blog published in America or Sadaam Hussein’s Iraq? And is Steve Hymon an award-winning former reporter or Baghdad Bob? The staff report will be released to the public tomorrow and we’ll post it then. Oh and Hymon, why not mention the numerous schools that Metro trains pass by where there have been incidents with students? Oh yea, this is a P.R. blog not an actual source for information. Congratulations to Walsh/Shea on a successful bid. It’s nice to see someone other than Tutor getting a contract. Stay close to budget and I’m sure you’ll get more opportunities to make Metro run. Too bad what is in the EIR’s for both the Crenshaw Corridor and the Subway to the Sea does not match what is in your article. The Subway to the Sea will cost 7-10 times more/mile and service 1/2 the passengers as will the Crenshaw Corridor. It is called the Corridor in the EIR’s because it is the only essential element of the L.A. and Orange County transportation system according once again to their own EIR’s. All the boring along Wilshire is highly dangerous because of the methane and hydrogen sulfide (H2S) at 1,000 times the amount they have dealt with so far according to their EIR’s. The land, according to the over 80 bore holes 200′ deep, is totally clean and zero problem and risk for boring. Most of the information for the bidding EIR is in the present EIR and must just be put into the proper form to allow bidding which they state in the article will not be allowed. That is why this is Environmental Injustice as laid out in the Crenshaw Subway Coalition lawsuit in Federal Court. Do you want to actually cite where in the EIRs you found some miraculous number saying the Crenshaw Corridor is going to have more riders than the Purple line, or are you just making stuff up? It’s “tomorrow” and still no report, and no ATCs. I live in this area and I work at LAX and I doubt I’ll ever use it. I’ll still end up driving from my apartment to the LAX Employee Parking Lot than paying $75 a month. Maybe if I lived far away it would be worth it. Metro needs to make trips to LAX cheaper for Inglewood residents because we live much more closer than everybody else who go there. No one working at LAX is gonna ride this if we have to pay $75 for only one or two station commute. Make it $20 a month for us and you might convince us. Otherwise, ain’t nobody here gonna use it. While I personally have no beef with a distance based fare structure, last I checked it was $35 a month to park at Lot E, and prices were supposed to go up. Factor in the employee shuttle ride (and, depending on which shift you work, the time you spend either searching for closer parking or parking further away and walking in), and of course gas and the occasional traffic…being able to ride in on the train may be worth it. And if you had a monthly pass, you could ride Metro elsewhere, it’s not just limited to your work commute. Of course, there are other factors, and I haven’t worked at LAX in a few years. But those are some things to consider as well. There are also other factors from Metro’s side too. There’s absolutely no guarantee that monthly passes will remain $75 a month. You cannot deny that the way things are going, eventually the price of monthly passes will have to go up. If it goes up to $100 a month, do you think residents living near LAX will use Metro to commute to LAX, or will they just continue to drive and park at their employee parking lot? Also, if you look at the map, unless the existing fare structure isn’t changed, a person that wants to transfer from the Crenshaw Line to the Green Line or vice-versa will end up paying an extra $1.50 (or whatever fare price it goes up to by the time it’s built) for the short 1 mile, one station trip from Aviation/Century to Aviation/LAX. This doesn’t make sense for a resident living near Hawthorne/Lennox for examply who works at LAX. They’ll end up paying $3.00 one-way just to get to LAX for a less than 3 mi commute. And the only other choice for the commuter is to buy a monthly pass which also doesn’t factor in distance or any guarantee it’ll remain at the same $75 a month rate. Given those two horrible choices, I think most people living in that area that works at LAX will continue to go with the car. I think for those who live near LAX and commute to LAX, the first option if their car breaks down is to bicycle the 3 miles commute until their car gets fixed. If anything, walking 3 miles to LAX isn’t impossible either. Cheaper alternatives exists than going Metro once you put in the distance factor. Think of it this way: if the place where you live and where you work is only 3 miles apart, do you see yourself wasting $75 a month for Metro when you can get by for free with a bicycle? You can get better exercise by bicycling and walking. By the time you saved up a year’s worth of monthly passes, you can buy a cheap moped off of craigslist. “Going Metro” only makes economic sense when one’s commute is long and far. It doesn’t make any sense if one’s commute is short and close.